I was a bit surprised hearing Nintendo had signed a collaboration agreement with developer Cygames to help create the next mobile game from the house that Mario built. It was a bit of an odd combination considering, outside of Monolith Soft and Tokyo Mirage Sessions, has never quite fully embraced the anime design that I have become quite fond with over the years. Yes, there are a few exceptions to the rule, but when Nintendo revealed Dragalia Lost, you couldn't blame me or anyone else for being rather surprised. But why should I be? Cygames created one of the most successful mobile titles of all time with Granblue Fantasy, a game that has made the company a huge amount of money thanks to a massive player base. Considering Nintendo is clearly pushing the free-to-play microtransaction model thanks to last year's highly successful Fire Emblem Heroes (bouncing back from the relative failure of Super Mario Run according to the company itself). Now, we have a free-to-play JRPG to cover, so let's take a deeper dive into Dragalia Lost as I explain this could be Nintendo's best mobile game yet (which isn't saying a whole lot but bear with me). Let's get the main hook out of the way first - Dragalia Lost plays very much like your traditional mobile action RPG, but with a higher degree of care and polish that you would expect from its makers. Your character is fully controlled by moving an arrow around the screen and interacting with enemies (or objects) by tapping on them while swiping to evade their attacks. The controls can take a little getting used to as I felt myself constantly brushing up against the edge of the screen as I moved my characters around. I eventually learned I only needed to give it a little bit of direction to move about quickly, but this can sometimes cause issues during moments requiring quick reactions. Speaking of, you'll spend a lot of the game roaming around linear environments engaging in real-time combat around fields and dungeons before eventually fighting a boss to complete whatever story mission or side quest you are engaging in. As you move about these areas, you will be able to bring up to four party members along for the journey that can be swapped around any time (you control one and the rest are by AI). This is important considering each character is class-based, meaning certain ones will do better against certain enemies than others. There are also a large number of abilities for each person to learn, injecting a good degree of strategizing into the equation. Elements also come into play in the way you'd expect them to - water is strong against fire, light against darkness, and so on. Sure, the user interface can be a tad on the busy side, but after a few battles, I had already figured out how the different menus and systems worked. Plus, the difficulty curve has a nice steadiness to it thanks to how short the quests are, so I never felt overwhelmed by any difficult segments early on. However, you can also opt to either bring a Helper with you on a quest or an IRL friend, though their only aid is the ability to use their skill up to three times. One of the key mechanics in battle is the ability to shapeshift into a Dragon that allows you to wield their power until their health runs out. After a while, you unlock the ability to let your party automatically travel on quests without you around to guide them, which is great if you just need to level up some lower-level characters. We also get to another big part of Dragalia Lost, and that's the option to build your own upgradable base called the Halidom, but this is rather limited in scope. The whole part in participating in this mode is that it can provide a range of buffs and other benefits both in and out of combat. This can be anything from raising your resistance to certain magic on the field to procuring rupies (in-game money) and items. You also have the opportunity to bond with (and level up) your dragon at the Dragon Roost by giving it presents which nets you items and equipment in return. Finally, while you are able to cosmetically decorate your Halidom in a variety of ways, you apparently are not able to visit anyone else's base. So... I don't really see the point in partaking in that single activity. I can spend a lot of time talking about the core systems at play, but let's move on to what will surely be this game's biggest point of contention - the microtransactions. Thankfully, this aspect of the game isn't anywhere near as egregious as I assumed it was going to be considering how these things tend to go. 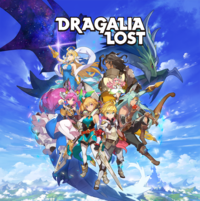 Dragalia Lost is perfectly okay if you decide you will never drop a single dime on the game. However, if you do have some (or a lot of) disposal income to blow, there this the gacha mechanic of rolling for characters, wyrmprints (upgradeable accessories represented as illustrations), and dragons you can transform into. Each character has their own star rating that displays both their rarity and their effectiveness in combat. The more stars they have, the rarer the character. In order to summon in the first place, you will need to either accrue one of two currencies: Wyrmite, which is gathered by playing or grinding through the game, or by spending money to collect Diamantium. I will say the rates seem very much on the lower side of things, but that was also true of Granblue Fantasy, so hopefully, Cygames has their "Premium Gala" events planned where the rates are doubled or more. As you may have already known from watching the trailers or if you've played Granblue Fantasy as I have, this game puts a lot of emphasis on both its story and characters. Unlike titles like Animal Crossing: Pocket Camp or the aforementioned Fire Emblem Heroes, this is a completely original property built from the ground up for mobile devices, so it only makes complete sense how crucial it is that players get to really know the people they'll be controlling. This is only reinforced through the personal story that accompanies each of these people. At least, in this case, Nintendo is working with a developer that knows how to make money - and a ton of it - on this platform. Because of that, we get some rather gorgeous character designs that really stand out which will help motivate people to engage in the gacha system - a good or bad thing depending on your opinion of these types of games. The chibi models are also fairly expressive, giving them a nice dose of personality given their stature. Another issue is the fact this game does feature a stamina system, but the amount of stamina you have goes up as you level up. And just like the microtransactions, it wasn't so confrontational about it. In fact, both systems felt pretty generous overall which will help give the game staying power since there's nothing worse than waiting around for meters to fill up or timers to wind down. It's the same time of experience I got with Granblue Fantasy. Sure, a lot of that may be due to my inherent luck with gacha-style games, but I spent about 20 hours before I had any real issues with this "feature", and that's a very good feeling to have. Lastly, the story is pretty much by the numbers. You take on the role of a prince who seeks out a pact with a dragon in order to assume the throne and protect the kingdom of Alberia. You see, Euden (canonical name) comes from a lineage of people who carry the power to shapeshift, so he sets off on a pilgrimage known as the Dragon Choosing. He's helped along by his sister who serves as an auspex and a magical faerie. Through the course of their adventure, they will face different perils that will put both his troupe and his home in a constant state of jeopardy as something sinister is always lurking outside... or within. While the plot isn't always that riveting, there is a good enough foundation there that made me feel invested going forward. All of this is backed by a fantastic soundtrack by DAOKO that fills your speakers with the type of tunes that will get stuck in your head. Even the characters bop around to it on the home menu and when you're setting up your loadout before battle! Seriously - I can't stop thinking about it even as I type up this review. On the topic of sound direction, the English voice cast performs their roles well enough, some better than others. Thankfully, if you're not into the English dub, you can always switch to the Japanese track (though it requires an additional download). I would actually recommend doing so because the Japanese dub is fully voiced as opposed to the English dub which only offers partially-voiced story scenes. Yes, it's one of those odd situations that I still don't fully understand from a contractual perspective. Perhaps you can chalk this up for wanting a simultaneous North America/Japan release, but that's pure speculation. While Nintendo is clearly throwing everything against the wall to see what sticks in terms of mobile games, Dragalia Lost represents a strong indicator that they're finally figuring out what will get players coming back, and a lot of it is thanks to Cygames. Whereas Fire Emblem Heroes quickly let me down with how oversimplified they made the game mechanics, and Animal Crossing: Pocket Camp facing a similar fate with its tiny environments, Dragalia Lost felt like the complete package, offering up a fun experience with a stylish presentation. Sure, this is only the first week and a lot of this can fall off a cliff once the launch period is over and done with, and the overall package isn't entirely original. Be that as it may, it's a solid start for something just starting off, and thus far, it has my full attention.